When the princely white Arabian stallion fell in a puddle in the middle of the sprawling arena, we thought our perfectly planned day on the Mayan Riviera in Mexico had crashed to the floor along with the horse. In an instant, people in the stadium were on their feet, craning their necks to see what had happened. All human breathing stopped for a long, long moment during this white-knuckle event. 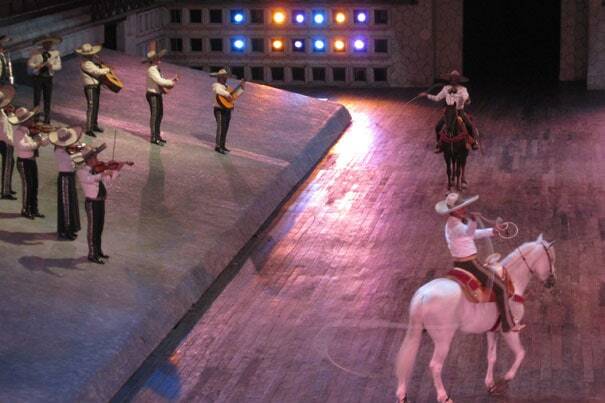 The horses were all part of the show at Xcaret (pronounced eesh-carette) – one a chestnut mare, the other a white Arabian stallion – and they had proudly entered the arena just minutes before with their gaucho riders who were ready to show us their lariat skills. When the accident happened we were at the nighttime Mayan Culture Show at Xcaret, an extravagantly staged world class spectacle depicting early Mayan life. Games using balls aflame, folk dancing and mariachi bands were all there dazzling color and sound. Occasional downpours had marred the humid, tropical day, and a leak in the arena’s roof created a puddle the size of a hula hoop on the floor. Down went the white stallion after sliding on the slippery floor, and the rider, too. He tried to help the horse to its feet, but the stallion’s hooves kept sliding in the wet. The audience became a still life scene until seconds later the horse’s trainer ran out from a hidden entryway under the bleacher seats. The rider motioned for trainer to loosen the saddle, and when he did the horse righted himself. Thunderous applause rose throughout the stadium, and the show went on without further ado. A bird’s eye view of the sprawling eco-park can be seen from a rotating scenic tower 262 feet above the ground. From here, visitors can see everything the park has to offer, from the white bell tower of St. Francis of Assisi Chapel to the inlet, beach, underground rivers and lagoon to the stunning green aromatic tropical jungle and palapa roofs. There’s no shortage of activities to enjoy at Xcaret. Visitors can swim with the dolphins – or even sharks, if they dare – go on a sea trek or snorkel tour or simply settle their backsides into a black inner tube and float down a lazy river. Xcaret promotes environmentally friendly practices that are making a difference in the world. The Marine Turtle Area, for instance, is just steps away from the Coral Reef Aquarium. Both are dedicated to the conservation and protection of these marine gems throughout the Mayan Riviera and worldwide. Performances are also held throughout the day, like the generations-old tradition Voladores de Papantla (Flying Men), a ceremony dedicated to the solar deity thought to provide fertility and abundant harvest. While sampling Mexican fare at Fiesta Charra, guests are also treated to a performance of charros and cowboys displaying their acrobatic skills while on horseback. Visitors who wish to explore Xcaret beyond a day or two might consider booking accommodations at the upscale Occidental Grand Xcaret, an all-inclusive hotel featuring 769 guest rooms starting at $124 per night. But it’s not necessary to stay next door to Xcaret to enjoy the property. The park is only a 20-minute drive from Playa Del Carmen and about a 40-minute drive from Cancun. Visitors to this area might also want to see the ruins in Tulum. Guides teach everything about the ancient Mayan civilization, which relied heavily on advanced mathematics and astronomy to construct pyramids, temples and other structures and now stand in ruins. 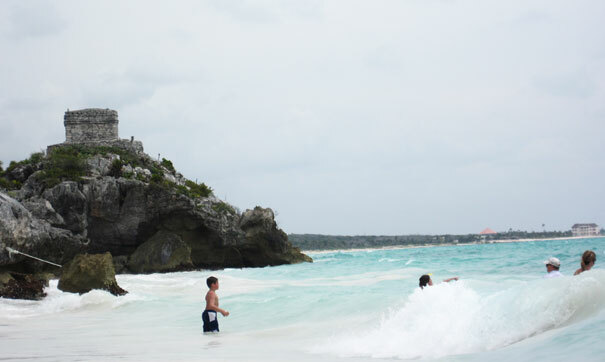 The beach below Tulum’s high cliffs is a gorgeous white ribbon of sand set before a pounding turquoise surf. The beach has been rated by Conde Naste as one of the ten best in the world and a half-day tour gives plenty of time to body surf in the warm crystalline water. Gail worked in the newspaper industry for fifteen years before launching her own full-service communications company, WordPower, in 2002. She brings a high degree of integrity, innovation and successful strategic planning to a diverse client base. Her specialties include media relations; writing, editing and graphic design; event management and corporate training. Her writing specialties include travel and tourism, finance and education. She is a resident of Wakefield, Massachusetts, where she lives with her husband, Tony.